November 2016 - Midwest Sports Publishing Network, Inc.
November 29, 2016 – BRP’s Ski-Doo X-Team racers opened the season in fast style by dominating the ISOC National Snocross series opener in Duluth, Minnesota. It started with Pro rookie sensation Elias Isohel winning the Dominator race on Friday night and continued with teammates Lincoln Lemieux and Tim Tremblay taking first and second in Pro Open on Saturday. Minneapolis, Minnesota – (November 29, 2016) – Team Arctic racers fulfilled the promise of an exciting new season of National snocross competition with a powerful performance at the ISOC Spirit National event in Duluth, Minn., winning five finals, capturing 14 podium finishes and taking second place in the Snow Bike category with the new SVX 450. 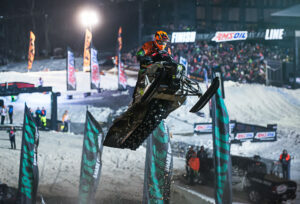 Only an abbreviated program due to foggy weather prevented greater success for Team Green and the Arctic Cat C-TEC2 6000 EFI engine. Fertile, Minnesota – November 29, 2016 – For 25 years Spirit Mountain in Duluth, Minnesota has played host to the opening round of the Snocross National circuit. Perched on the high ground next to Lake Superior, the track at this year’s event featured a challenging downhill dogleg as well as the usual uphill step-up and a downhill rhythm section. Pro Open rider, Logan Christian, doc/AMG Peterbilt/Arctic Cat, is riding some new technology this season– an EFI (Electronic Fuel Injection) mod sled, which only a couple riders are currently piloting. Friday started slow for Christian who encountered sled issues during the seeding for the Dominator race. The team made changes to the sled setup and were ready for the official start of the Amsoil Championship Snocross National Tour on Saturday. Logan Christian came out strong for Round 1 transferring to the final with a 1st and a 4th place in his two qualifying heats. Jacob Yurk, Country Cat/Royal Distributing/Arctic Cat, made his debut as a new member of the Christian Brothers Racing team in what turned out to be a crowded Pro Lite class. In his first Pro Lite race of his career, Yurk jumped out front when the green light lit in the first round determined to set the pace. Late in the heat an unfortunate miscalculation tossed Yurk off his sled resulting in a 7th place finish. In Heat 2 Yurk rode to a confident 2nd place finish, placing him in the LCQ with 14 other riders. Round 2 of racing at Duluth was postponed due to fog. Riders had a meeting with race officials and it was determined conditions were unsafe for racing. No announcement has been made regarding when or if Round 2 will be rescheduled. Due to the race cancellation the CBR/Arctic Cat 120 giveaway has been postponed until further decisions have been arranged with ISOC. The 120 will be given away with just the Duluth entries, the remainder of the details are still being worked out. After one event Christian is tied for 5th place in Pro Open points, Yurk sits in 22nd place in Pro Lite points. Next up for the team, Country Cat ACS Snocross National at Colorado Adventure Park in Winter Park, Colorado, December 16-17. For more info on Christian Brothers Racing visit www.christianbrosracing.com. Be sure to check out Episode 1 of The Renegade Series with Logan Christian. Zimmerman, Minnesota – November 28, 2016 – Corin Todd continued his progression as one of the up and coming stars of AMSOIL Championship Snocross on Saturday night, finishing 1-1 in his Pro Open heat races to earn the top qualifier spot for the main event. November 28, 2016 – Tucker Hibbert took a podium finish at the shortened 25th Annual Duluth National over Thanksgiving weekend. Races were completed Friday and Saturday night in Duluth, Minn. before heavy fog rolled in, blanketing Spirit Mountain ski hill. The poor visibility prompted ISOC National Snocross officials to call off Sunday’s races, including round two of the Pro Open class.